On March 27, 1836, over three hundred rebellious Texan prisoners, most of them captured a few days before while battling the Mexican army, were executed by Mexican forces. The "Goliad Massacre" became a rallying cry for other Texans, who shouted "Remember the Alamo!" and "Remember Goliad!" at the decisive Battle of San Jacinto. After years of antagonism and tension, settlers in the area of modern-day Texas decided to break off from Mexico in 1835. The movement was mainly led by USA-born Anglos who spoke little Spanish and who had migrated there legally and illegally, although the movement had some support among native Tejanos, or Texas-born Mexicans. The fighting broke out on October 2, 1835 in the town of Gonzales. In December, the Texans captured the town of San Antonio: on March 6, the Mexican army took it back at the bloody Battle of the Alamo. James Fannin, a veteran of the siege of San Antonio and one of the only Texans with any actual military training, was in command of about 300 troops in Goliad, about 90 miles away from San Antonio. Before the Battle of the Alamo, William Travis had sent repeated pleas for aid, but Fannin never came: he cited logistics as the cause. Meanwhile, refugees came pouring through Goliad on their way east, telling Fannin and his men of the advance of the massive Mexican army. Fannin had occupied a small fort in Goliad and felt secure in his position. On March 11, Fannin received word from Sam Houston, overall commander of the Texan army. He learned of the fall of the Alamo and received orders to destroy the defensive works at Goliad and retreat to the town of Victoria. Fannin lingered, however, as he had two units of men in the field, under Amon King and William Ward. Once he learned that King, Ward and their men had been captured, he set out, but by then the Mexican army was very close. On March 19, Fannin finally left Goliad, at the head of a long train of men and supplies. The many carts and supplies made the going very slow. In the afternoon, Mexican cavalry appeared: the Texans struck up a defensive position. The Texans fired their long rifles and cannons at the Mexican cavalry, inflicting heavy damage, but during the fighting, the main Mexican host under the command of José Urrea arrived, and they were able to surround the rebel Texans. As night fell, the Texans ran out of water and ammunition and were forced to surrender. This engagement is known as the Battle of Coleto, as it was fought near Coleto Creek. The terms of the Texans' surrender are unclear. There was much confusion: no one spoke both English and Spanish, so negotiations were carried out in German, as a handful of soldiers on each side spoke that language. Urrea, under orders from Mexican General Antonio López de Santa Anna, could not accept anything but an unconditional surrender. Texans present at the negotiations recall that they were promised that they would be disarmed and sent to New Orleans if they promised not to return to Texas. It may be that Fannin agreed to an unconditional surrender on the basis that Urrea would put in a good word for the prisoners with General Santa Anna. It was not to be. The Texans were rounded up and sent back to Goliad. They thought they were to be deported, but Santa Anna had other plans. Urrea tried hard to convince his commander that the Texans should be spared, but Santa Anna would not be budged. 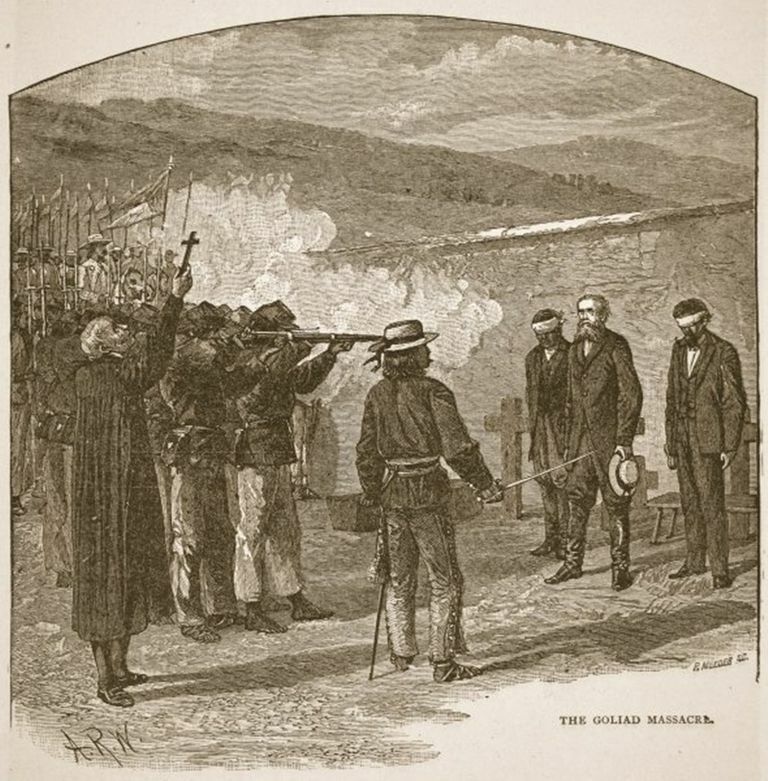 The rebel prisoners were put under the command of Colonel Nicolás de la Portilla, who received clear word from Santa Anna that they were to be executed. On March 27, the prisoners were rounded up and marched out of the fort at Goliad. There were somewhere between three and four hundred of them, which included all of the men captured under Fannin as well as some others that had been taken previously. About a mile away from Goliad, the Mexican soldiers opened fire on the prisoners. When Fannin was told he was to be executed, he gave his valuables to a Mexican officer asking that they be given to his family. He also requested not to be shot in the head and to have a decent burial: he was shot in the head, looted, burned and dumped into a mass grave. About forty wounded prisoners, who had been unable to march, were executed at the fort. It is unknown how many Texan rebels were executed that day: the number is somewhere between 340 and 400. Twenty-eight men escaped in the confusion of the execution and a handful of physicians were spared. The bodies were burned and dumped: for weeks, they were left to the elements and gnawed on by wild animals. Word of the Goliad Massacre quickly spread throughout Texas, infuriating the settlers and rebel Texans. Santa Anna's order to kill the prisoners worked both for and against him: it assured that settlers and homesteaders in his path quickly packed up and left, many of them not stopping until they had crossed back into the United States. However, the rebellious Texans were able to use Goliad as a rallying cry and recruitment soared: some no doubt signed on believing that the Mexicans would execute them even if they were not in arms when captured. On April 21, less than a month later, General Sam Houston engaged Santa Anna at the decisive Battle of San Jacinto. The Mexicans were taken by surprise by the afternoon attack and completely routed. Enraged Texans shouted "Remember the Alamo!" and "Remember Goliad!" as they slaughtered the terrified Mexicans as they tried to flee. Santa Anna was captured and forced to sign documents recognizing Texas' independence, effectively ending the war. The Goliad Massacre marked an ugly moment in the history of the Texas Revolution. It led at least partially to the Texan victory at the Battle of San Jacinto, however. With the rebels at the Alamo and Goliad dead, Santa Anna felt confident enough to divide his force, which in turn allowed Sam Houston to defeat him. The rage felt by the Texans at the massacre manifested itself in a willingness to fight that was evident at San Jacinto. Brands, H.W. Lone Star Nation: the Epic Story of the Battle for Texas Independence. New York: Anchor Books, 2004.